Accordingly, on 1 October 1963, Archbishop Olcomendy proclaimed the area a parish in its own right. Fr. Saussard chose to place his parish under the patronage of St. Vincent de Paul. To set the parish on a defined course, he commissioned Sister Gloria of the Franciscan Missionaries of Mary, to under a sociological survey. The findings led to the provision of additional activities. The boys’ Conference established a youth club and a junior library. The ladies’ Conference introduced needlework, sewing and cooking classes. Free tuition and literacy classes were provided by a team of 23 qualified volunteer teachers. One parishioner started book-keeping and typewriting classes. Kindergarten classes were started. Dance classes led to the holding of cultural shows. Even guitar lessons were conducted. 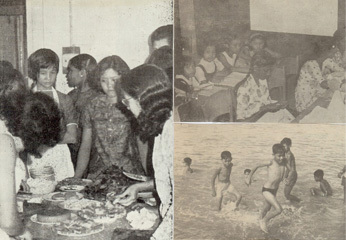 Other activities included outings, excursions and picnics. The men’s Conference took on the repairing and improving of the houses of the poor. Free medical services were provided by doctors who had clinics in the vicinity. Even the present stately Sunday canteen had its origin in the shop house of Jalan Kayu. All this was accompanied, simultaneously, with sustained exposure of the Catholics to faith formation and spiritual development. 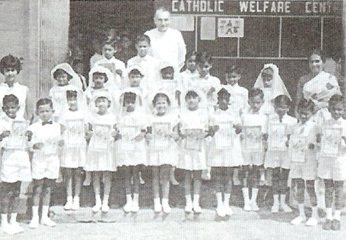 Systematic religious instruction was provided to prepare children for their First Holy Communion. This was the beginnings of formal catechism classes. The Centre stayed open all day long for the recreation and private study of children. Adults sought out the centre for help of sorts. As time moved on and the centre became more vibrant, dark clouds loomd on the horizon. It had borrowed $40,000 from the funds raised for a church building and this had to be repaid. The cost in maintaining the centre soared by the day. It survival was dependent on donations. Parishioners, themselves, were hard-pressed. Sunday collections barely yielded more than $70. There were the anonymous benefactors but few in number. 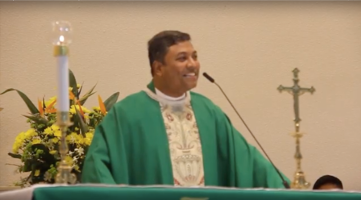 When the cost of operating the centre was more than it could bear, Fr. Saussard offered it to the Catholic Welfare Service to be run as one of its branches on the understanding that the parishioners of St. Vincent de Paul would continue to render their services on a voluntary basis. 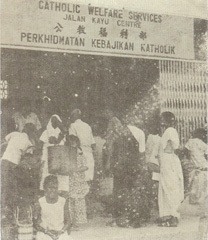 On 16 April 1966, the hand-over took place, and the centre was renamed the Catholic Welfare Service Jalan Kayu Centre. Fr. Saussard remained in charge, retaining his living quarters. The basement chapel continued to serve as the place of worship. Meanwhile, fund-raising for a suitable church building, went on unabated. 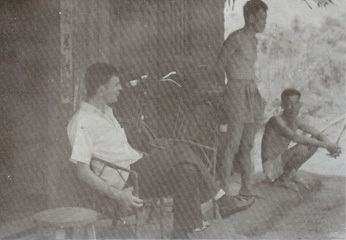 In 1966, a site was found along Jalan Resak. It was a submerged plot that had for long served as a dumping ground for felled coconut trees. The site secured, Fr. Saussard took a deserving break and went home on leave to France. To fill in for him, came Fr. Jean Jacques Troquier. His contribution was one of consolidation and the re-directing of parish initiatives. A Family Movement group emerged, with the members spending evenings reflecting on the documents of the Second Vatican Council, especially those that touched on the life of the community. 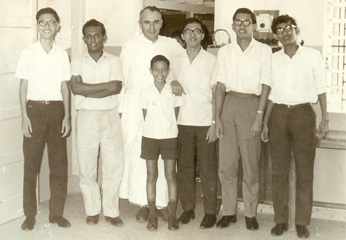 This led to the establishment of the Seletar Hills Residents Association, through the initiative, largely, of Fr. Troquier. It yet thrives, though the leadership has been handed over to the residents. His final act was to organize the catechists into the Confraternity of Christine Doctrine and a Joyful Vanguard group.